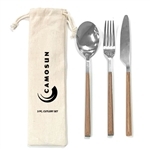 Compact size, 18/8 food grade stainless steel spoon, fork and knife packed in a drawstring cotton bag. Reusable and dishwasher safe. Includes one colour imprint on bag. 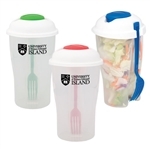 Food grade large plastic cup to hold salad, plastic fork and a small dressing cup that fits right in the container. BPA free and FDA compliant. Dishwasher safe. Available in black/clear, green/clear, orange/clear, red/ clear and royal blue/clear. Includes a one colour imprint. 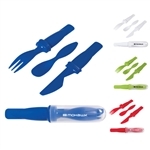 ABS cutlery and protective PP plastic carrying case includes fork, spoon and serrated knife. Reusable and easy to clean. Dishwasher safe. Available in Lime green/ clear, red/clear, royal blue/clear and white/ clear. Includes a one colour imprint. 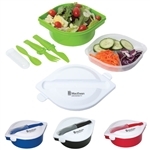 PP plastic lunch box with separate sectional tray and three-piece ABS cutlery set (fork, spoon and serrated knife) that fits in the top of the lid. Snap-lock lid. BPA free and FDA compliant. Microwave and dishwasher safe. Available in black/white, lime green/white, red/white, royal blue/white. Includes a one colour imprint.